Water cooling a spindle - KISS Method? Not to extend this thread into infinity, but 120 gph was used because of the realistic output of the pump in the above cooling kit.
. . . .The loss from one 90 degree bend is approximately 0.5*Pd, . . . When numbers like that are mentioned, they normally relate to 90 degree "elbows" where the bend radius is quite sharp....something like the bend radius being equal to about 2x the pipe diameter. With our hoses, the bend radius is about 20 to 30 times the pipe diameter. - the engineering calcs/experiments show no real benefit in shortening the hoses. The simpliest KISS method would be to connect the water hose to a tap/faucet and let the outlet run to the garden . . . . . . Sorry I've been away for a while. I had a little trouble with the first Swiftech MCP355 that arrived - it was full of blue smoke ;-). I returned it to Swiftech and their customer service was kind enough to send me a replacement. Attached is a picture of the final installation. I found a nice little liquid reservoir at my local auto parts store ($15). I'm using about a 50/50 mix of (environmental safe) anti freeze and water. 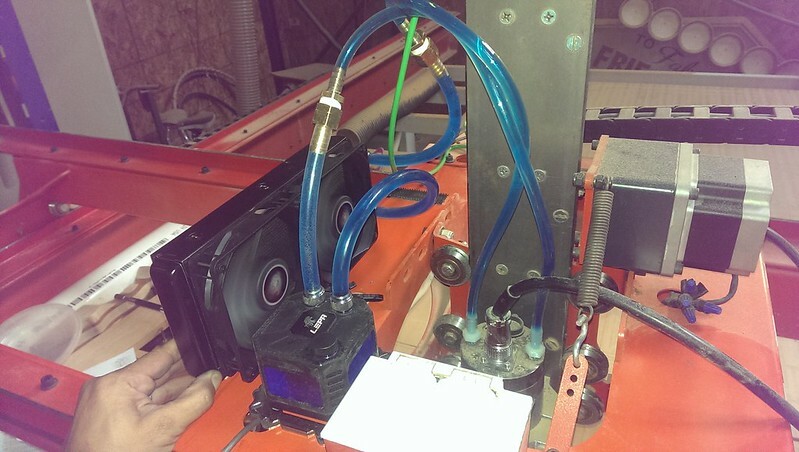 The hoses are 5/16" and run through all the cable chains, gantry and water cooled router. I haven't measured the flow, but it appears to meet the beer glass test. Since I have the temperature meter on the system, circled in red in pic #2, I should be able to monitor the temp. If needed a small radiator under the table should work nicely. I haven't started cutting yet, but so far I'm pretty happy with this little pump. A bonus is that its runs totally silent, not that that matters when cutting. More later, I’m getting close to making dust! Mike i have almost same system as you - from car reservoir and aquarium pump. So far looks it dont need extra radiator. Cooling liquid tubes what are in cable chains have enough cooling space (about 22 meter tube). But havent tried yet bigger cutter when 6mm dia. I need to get some information on the correct collant to use. i live in the tropics where the temperture never goes under 75 deg. at the moment i am using it full strength. the inside of the hose has this brown sticky flim coating. I started with 100% coolant & found out it is to viscous to go through the tiny tube,. Then I tried 80/20, then 70/30, then 60/40... & eventually I just pour a 1 liter coolant into the coolant tank almost 3/4 filled & runs happily ever after. I've only top up the coolant tank once with tap water since then. No problem with goo inside the tubing but I can't tell as my tubes are opaque. I also had some brown sticky stuff inside the tubes after running, ran it no problems for couple of months and washed it out, changed the liquid no problem now. It must be some grease that was inside the channels in the spindle. I'm going to get a 2.2kw spindle water cooled. My question is not on cooling, but rather noise. These little guys run 10-24K rpms. I'm looking for something that is a lot quieter than my Milwaukee 3hp. The fan on the Milwaukee isn't loud, but the out of balance router motor is. I have two motors to swap out when the bearings need replacing an have run the spare on the floor and it's pretty quiet, put in the MM and it it very loud, makes it appear it's the fan. Anyway, how's the noise level of the Chinese spindles? Well said Ken. When doing 3D carving with a 3mm ballnose it is STILL whispering. I went for the Air cooled...less hassle..no water no pipes no pumps...and still whispering. Reviving an old thread here to share my new improved water cooled spindle setup. I went to Fry's Electronics and purchased a "LEPA Exllusion 240" liquid CPU cooler. It's an all-in-one dealy with a radiator, 2X muffin fans, and a reservoir with a CPU heat exchanger. Cost was about $130. All I had to do to make it work with my spindle was cut a tube between the CPU heat exchanger/reservoir and the radiator and install 2X tubing adapters to step down the diameter from the cooler tubes to the tubing on my spindle. I epoxied the radiator and reservoir to my Y-car. Power comes from the 12v power supply brick I have tucked inside the Y-car. It's been about 9 months and everything is still working. The only upkeep necessary is blowing out the dusty radiator with compressed air every so often. I was wondering if a CPU cooler would work. Thanks for posting this. Are your muffin fans mounted as shown? Also, have you measured the temperature of your spindle after it's been running for awhile (say with a temperature gun) to make sure it's staying cool enough? It works great! I've run the spindle for hours and it barely gets warm to the touch. Putting my hand next to the radiator, I can feel warm air. The setup works incredibly well. The fans are mounted exactly as shown. I am holding it in the photo because I hadn't expoxied the radiator yet, but that's where it ended up. Thanks for the coolant recipe I was wondering what needed to be used.